The Vancouver Condo Buzz » SUMMER UPDATE! North Vancouver’s LOCAL on Lonsdale Condo Tower Nearing Completion (Final Release from low $300’s!) 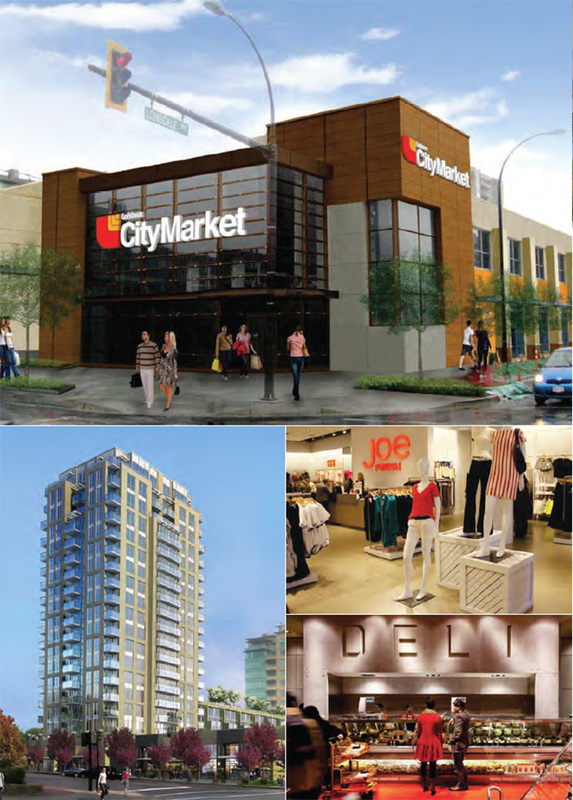 -PLUS- New Central Lonsdale Loblaws CityMarket Grocery Store Opening in July! SUMMER UPDATE! North Vancouver’s LOCAL on Lonsdale Condo Tower Nearing Completion (Final Release from low $300’s!) -PLUS- New Central Lonsdale Loblaws CityMarket Grocery Store Opening in July! North Vancouver’s LOCAL on Lonsdale Condos Nearing Completion! 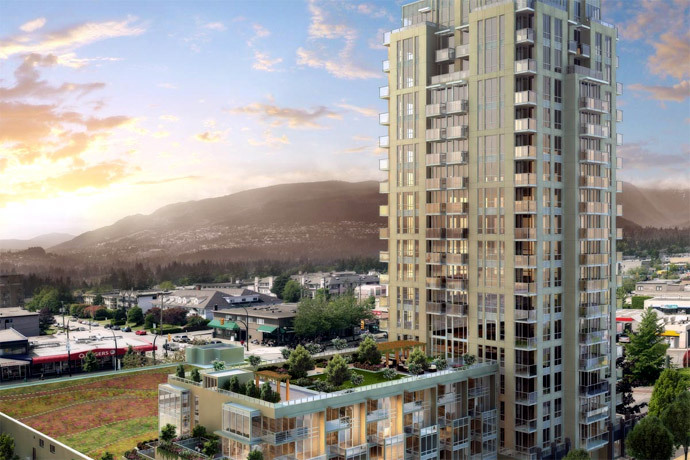 The FINAL RELEASE of view residences at LOCAL North Vancouver condo tower is now selling! Move in late September 2013! The most exciting premier development in the Central Lonsdale neighbourhood on the North Shore is nearing completion and we’re excited to announce that it looks AMAZING! 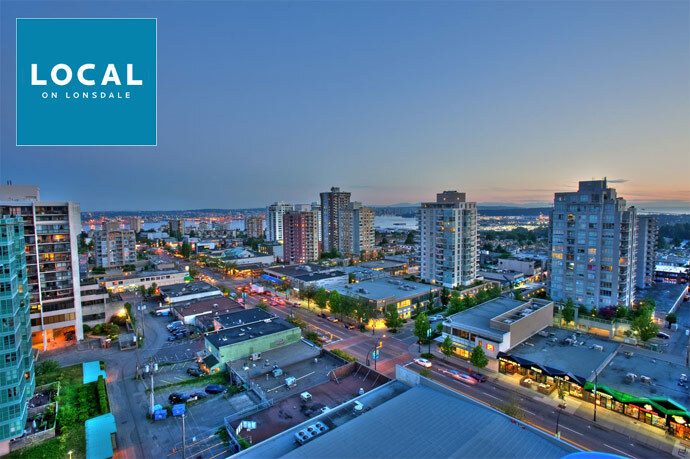 As the newest community hub, LOCAL on Lonsdale is a 20 storey high-rise concrete tower commanding amazing views, an impeccable location with 100 WalkScore and an impressive retail podium that is now fully constructed. The finishing touches are just around the corner and LOCAL North Vancouver will certainly be a welcome addition to this dynamic and ever changing urban community. But hurry as there is only a limited inventory of presale homes still remaining. In September, the North Vancouver LOCAL condo tower will near completion and new homebuyers will be able to tour the fantastic new presentation centre and explore the fully furnished display suite located on site at the LOCAL on Lonsdale tower. Anthem Properties is the developer of LOCAL North Shore and their marketing reads: Life at Local affords you immediate access to every convenience, brilliant North Shore views and the best of nature starting from just $309,900*. This is affordable urban living on the North Shore, and it’s available for move in Fall 2013! NOW SELLING – visit www.localonlonsdale.com for more up-to-date information. The presentation centre is at 1709 Lonsdale Avenue North Vancouver BC and the new sales centre will be opening in September 2013 on site. 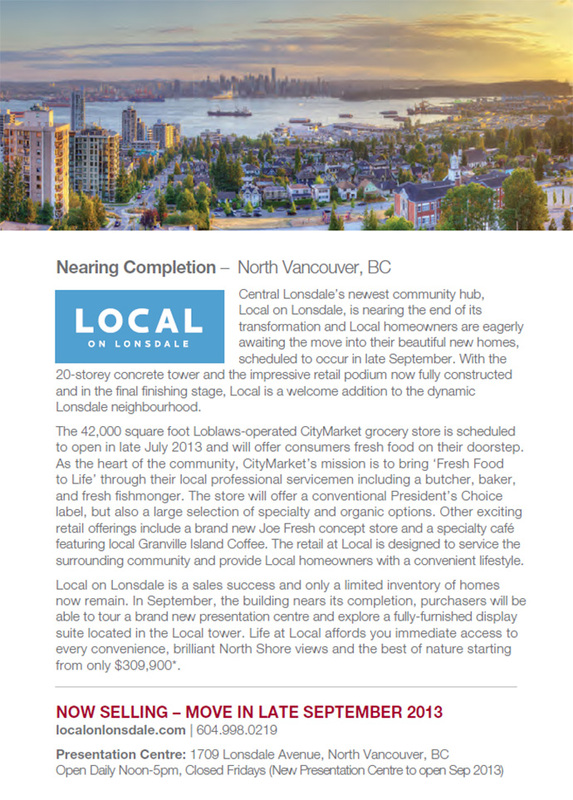 According to Anthem Properties’ latest Summer Newsletter, the Loblaws CityMarket at LOCAL North Vancouver retail podium will be opening late July 2013! This is going to be amazing for LOCAL on Lonsdale condo owners in addition to everyone who lives in Central Lonsdale! The Loblaws operated CityMarket LOCAL North Vancouver grocery store will be over 42,000 square feet in size and will offer customers fresh food on their doorstep. As the heart of the new Central Lonsdale LOCAL North Shore condo community, CityMarket by Loblaws will bring ‘Fresh Food to Life’ through their local professional servicemen including an on-site butcher, baker and fresh fishmonger. In addition the LOCAL Loblaws CityMarket Central Lonsdale grocery store will also offer all the conventional President’s Choice labeled foods, in addition to a very large selection of specialty and organic options. Other exciting retail offerings that complement the new Central Lonsdale LOCAL Loblaws CityMarket grocer includes a brand new Joe Fresh concept store and a specialty café featuring local Granville Island Coffee. The convenience of the CityMarket Loblaws grocery store on Lonsdale Avenue is going to be an amazing urban experience! We can’t wait! From their latest email: There’s more time in the day to do what you love when you live right above where you shop. Host a dinner party with fresh ingredients sourced from the brand new 42,000 sq. ft. Loblaws City Market grocery store. Keep your wardrobe up-to-date with the Joe Fresh retail boutique. Stay on top of your health with your own on-call family doctor at the new Medical Centre. All of this and more is located right downstairs at LOCAL in Central Lonsdale North Vancouver. LOCAL’s prime Central Lonsdale location offers you even further convenience and variety with over 200 local businesses located within a 3-block radius of your home. The condo building itself will have a landscaped 1 acre green roof in addition to a seventh floor roof terrace with gardening plots. As well, the entrance to the community will have public art displays in addition to a Lonsdale Avenue Plaza. The LOCAL North Vancouver condo building will also have an on-site dog wash, bike storage area, lots of visitor parking, separate entrance to retail podium than the residential component and storage lockers. There is a hobby room/workshop area in addition to a fully equipped fitness centre and professionally designed and fully furnished guest suite on site. All North Van LOCAL condos will come with the Travelers 2-5-10 home warranty.